Back in last July – when choosing photos to use in the epic The Dreams of the MeeGo Diaspora post – I noticed that it is quite fascinating to look at the various tablets and mobile phones we’ve been using over the years. Back then they all were so new, shiny, and exciting, and yet hardware moves so fast that something from a year or two ago would look quite dated now. And so I thought it might be interesting to keep some sort of record on what kind of computing devices I’ve been using for my work – and how – over the years. This post is the first of the series, and shows the setup I’ve had during 2012. Many programmers believe in beefy workstations and huge multi-display setups. I was never so much into that, and as I’m spending half of my working time on the road, it has made sense to adapt to a more minimalist setup. 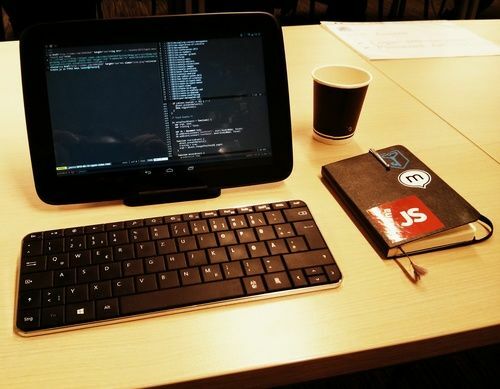 A small laptop, a small tablet, and not much else. Most of my programming is for web services, and so the main things I need are a browser and a terminal. After the move to Berlin, various video conferences with project partners all around the world via Google Hangouts or Skype are also almost a daily fare. My current setup handles these use cases quite well, and is simple and light to be carried around Europe without any problems. At the same time, the nomadistic lifestyle has meant there is really quite little use for a phone. I do couple of calls or SMS per week, but in general the roaming charges, and better communication tools that Internet offers means that phone is just another screen to the services I use, essentially just a small tablet. 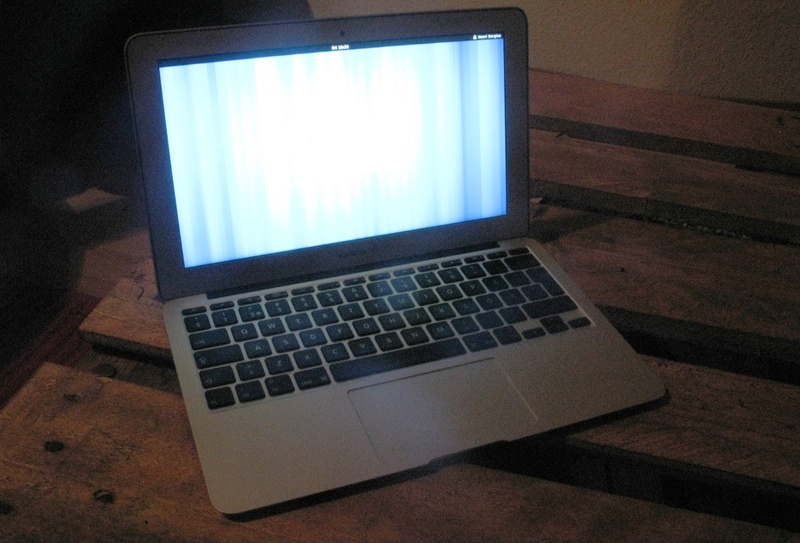 My current main computer is the MacBook Air I got in early 2011. Apart from the lousy battery life, I’ve been generally very happy with it. It is small, light, and still has a reasonably good screen and keyboard. The solid state drive makes it also quite fast. I’m running this laptop with Ubuntu 12.04 and the GNOME Shell. Linux supports this hardware quite well, meaning that I’ve never had issues with things like sound, the multi-touch trackpad, WiFi, or suspending. But external displays have sometimes been tricky. During a typical workday, I only have two windows open: a full-screen Firefox window for email, browsing, and testing the software I write, and a full-screen terminal window running Vim with various splits. All of the rest of the software runs usually on a cloud hosting provider, or inside a Vagrant virtual machine. I sometimes also run Libreoffice, but more and more of my office productivity needs are now handled by Google Drive. The battery life issue is what’s making me rethink this part of the setup. Apple promises a new MacBook Air about five hours of use, but after two years, and with running Linux instead of OS X, I’m down to maybe two and half hours. This is by far not enough, especially during conferences or travel where power outlets are not readily available. I’d also love to get to a device with a bit more standardized ports. Having to replace faulty Apple laptop chargers and to remember the display dongles when presenting something is a bother. Having used tablets daily for a long time, I’m a big believer in them as both production and communication devices and as a much better computer during free time. Actually, to help maintain a sensible work-life balance, our household of two programmers has a strict no laptops at home policy. I used a Transformer Prime convertible tablet during the first half of 2012. With its detachable keyboard it was a great device as a travel computer and for conference live-blogging. The keydock contained an additional battery, and so I could rely on being able to use the device for a full day. At the same time, the tablet was a bit big and clunky for travel. You’d always have to dig it out of the bag separately, and such a big device wasn’t comfortable when reading in bed. 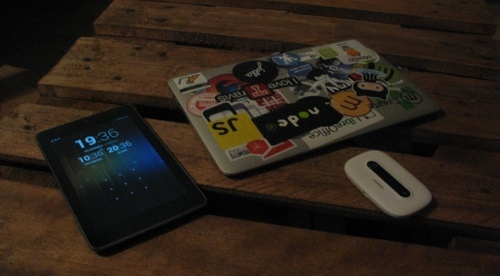 And so, when the Google’s Nexus 7 came out, I swapped devices. The seven inch form factor is great for both reading at home, and during travels. When you need to swich trains or board an airplane, you can just stick the device in your pocket. It certainly isn’t comfortable to keep there for long times, but pn short transfers this is a very handy possibility. No wonder people on the iOS side of the fence are so excited about the iPad Mini! I use the tablet for the various video conferences I have, and do most of my web reading with Firefox Mobile and Instapaper. On work trips I also read books on the Nexus, so that I don’t need to bring the dedicated Kindle e-reader as an extra device. Firefox Mobile is great in that it synchronizes my passwords and browsing history between the tablet and my laptop, so that I can always easily pick up and continue on either device. Since much of what I do happens online, being able to connect from everywhere is very important. While I could use JoikuSpot to share the Internet connection from my Symbian phone, having a dedicated device for this purpose makes sense. With the MiFi wireless base station I can spare the battery of my phone. As the MiFi is only used for Internet access, I can buy cheap pre-paid SIMs from each country I travel to. Paying somewhere around ten euros for a month of Internet abroad certainly beats the usual roaming charges! However, having to dig this device from my bag and start it whenever I need connectivity is a slight hassle. 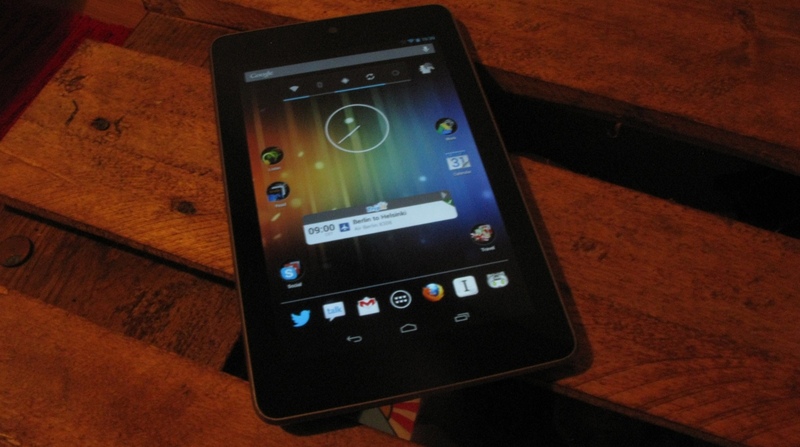 Now that there is a Nexus 7 with 3G support available that might be a better option. 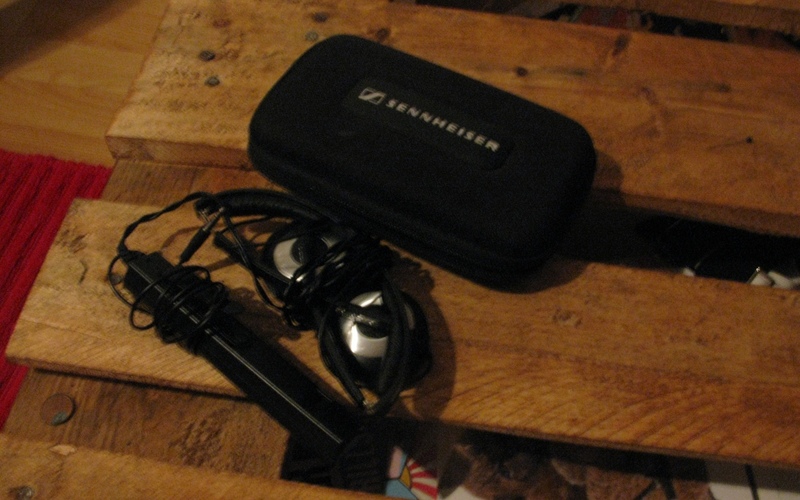 This is actually a piece of gear I’ve had for a while: For music and teleconferences I’m using Sennheiser’s noise cancelling headphones that I bought back in 2008. While they’re bulkier and pricier than typical in-ear headphones, they are great especially when traveling or working in a noisy environment. The headphones are slowly getting a bit frayed, and so I will probably have to look for replacement soon. Having optional Bluetooth could be handy. The current setup has generally served me well for about two years of intense travel and open source development. We generally run our computers with a two year replacement cycle, and so at least my laptop is due to be replaced quite shortly. Thanks to services like Travis CI and Heroku, my computer needs are becoming even simpler than they used to be. 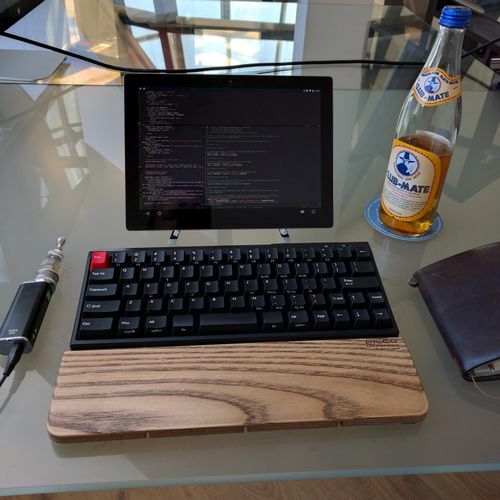 Theoretically I could work with any device that has a good screen, a good keyboard, and can run terminal and a web browser. This means I could even work on an iPad. At least nearly. I’m also intrigued about switching to a Kindle Paperwhite 3G as my reading device. Better screen, and ability to access WikiPedia anywhere in the world for free! If you have any great suggestions for a device or a combo fulfilling those requirements, please comment! If this all sounds very consumeristic, it should be noted that my old work devices always get recycled to other users. When you do mobile and web development, you need to have access to the new hardware that people are buying and using.